Where Roots And Wings Entwine: Race day style. Not only does summertime mean the welcoming of sunny days spent at the beach and BBQ’s aplenty it also means the chance to dress up for summer weddings and summertime formal occasions such as race days. Whilst I have yet to attend a race day, as I would love to do so one day and dress to impress at the most anticipated summertime formal occasion Ascot’s Ladies Day, I often find myself imaging what show-stopping outfit I would wear to grace the event. Whilst unfortunately I cannot attend the races at the Royal Ascot this year again – which may be a good thing as I don’t know how glamourous and comfortable I could be this year thanks to my ever-expansive baby bump – a girl can dream and have fun thinking about her ideal race day outfit. I love the beautiful Dovie Duchess Satin Dress from Coast which is crafted from luxurious satin. I adore the splash of colour thanks to the floral print which would help flatter my frame along with the addition of a belt to accentuate my frame beautifully. To add a touch more colour and allow me to keep those much needed essentials to hand stylishly (a compact mirror and lippy being top of the list so I can make sure I am looking my best at all times) I would love to style my outfit with the modern and very gorgeous Roxanne Clutch. No visit to the Royal Ascot could happen without a stylish headpiece, with my top choice being the chic Ruth Fascinator. Being a subtle pink colour I think this piece would be the perfect finishing touch to the Dovie Duchess Satin Dress and the stunning woven sculptural bow adorned with feminine feathers would definitely add a touch of drama to my outfit. To complete my race day outfit I would opt for a classic pointed-toe court shoe, with the Valentina Shoe being my top choice. Have you been to the races? 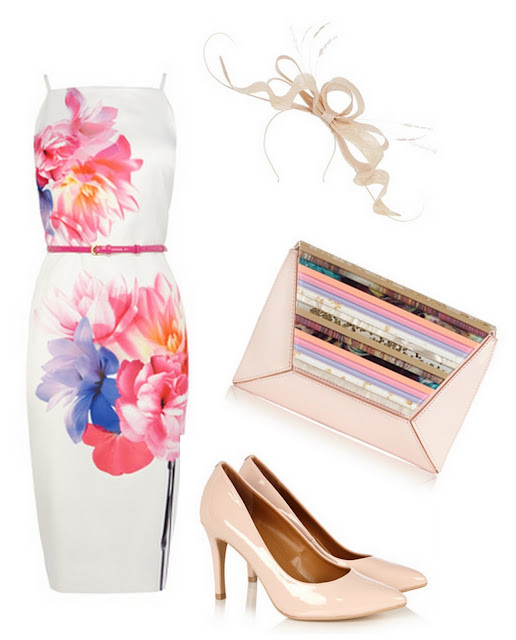 Do you have any tips on how-to-dress to impress at the races? As I am always impressed with the glamourous and beautiful outfits worn by the women attending the Royal Ascot, I love to watch the coverage on TV and then afterwards flick through pictures from the event in newspapers and magazines. To tantalise my admiration of glamourous outfits perfect for dressing-to-impress at a prestigious events such as the Royal Ascot in a few weeks’ time, The Daily Mail recently published a fashion guide filled with winning style for the summer season to impress at the races, highlighting how to style flattering hats, patterned dresses and chic suits for summer formal events. Are you going to Ascot this year? I would love to hear about your outfit.